Penelope was the famous queen of Ithaca in Greek mythology, for Penelope was the wife of the Greek hero Odysseus. 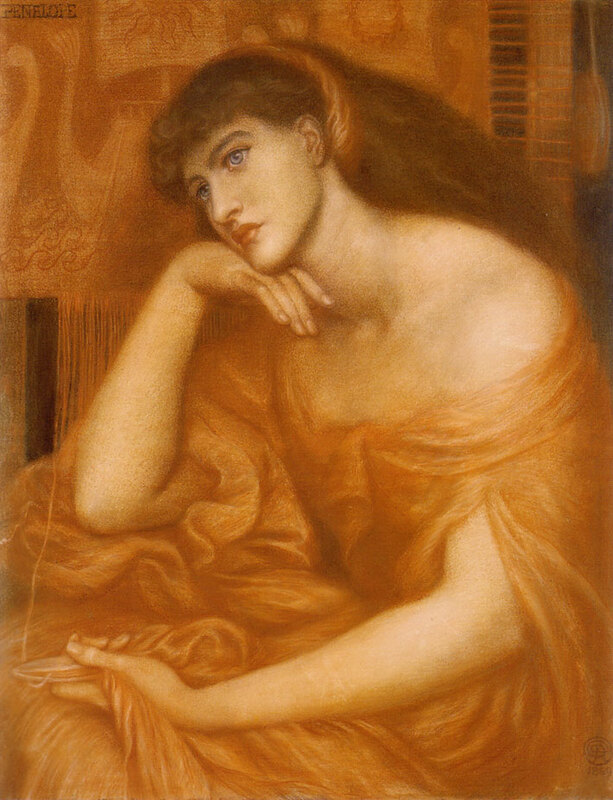 Penelope has also been highlighted as the most faithful of wives, as it was said that Penelope waited 20 years for her husband to return to her. Penelope was the daughter of Icarius, a prince of Sparta and brother of Tyndareus. The mother of Penelope is normally said to have been the Naiad Periboea, and therefore Penelope had many siblings, although the most famous is probably a sister named Iphthime. A story is sometime told about how Penelope got her name, for desiring a son, Icarius was said to have thrown his daughter into the sea to drown her when she was born. The baby girl was rescued by some ducks, and taking it as a sign from the gods, Icarius afterwards took care of his daughter and named her Penelope, after the Greek for duck. Penelope comes to the fore at a time when potential suitors for Helen, daughter of Tyndareus, were gathering in Sparta. Amongst the suitors was Odysseus, son of Laertes, but the Ithacan soon realised that his claim was overshadowed by many other Suitors of Helen. Odysseus therefore set his eyes upon Penelope, another beautiful princess, although not as beautiful as Helen. At the time, Tyndareus had a problem about how to avoid bloodshed and ill feeling amongst the gather suitors, and it was Odysseus who came up with the idea of the Oath of Tyndareus, so that the other suitors were bound by oath to protect the chosen husband of Helen. For helping him, Tyndareus used his influence to ensure that Odysseus would marry his niece, Penelope. Some say though, that Odysseus still had to do some work, to win the hand of Penelope, perhaps winning a running race to become her husband. In either case Penelope and Odysseus would wed and Odysseus succeeded his father as king of the Cephallenians. Penelope and Odysseus would live happily together in a palace upon Ithaca, and Penelope would give birth to a son for Odysseus, a boy called Telemachus. The blissful life of Penelope and Odysseus would end though when the Oath of Tyndareus was invoked by Menelaus, and Odysseus, despite his misgivings, would have to assemble a force and travel to Troy, to fight for the return of Helen. Ten years of fighting would ensue when Penelope and Odysseus were separated, and during this time, Penelope ruled her husband’s kingdom in his place. 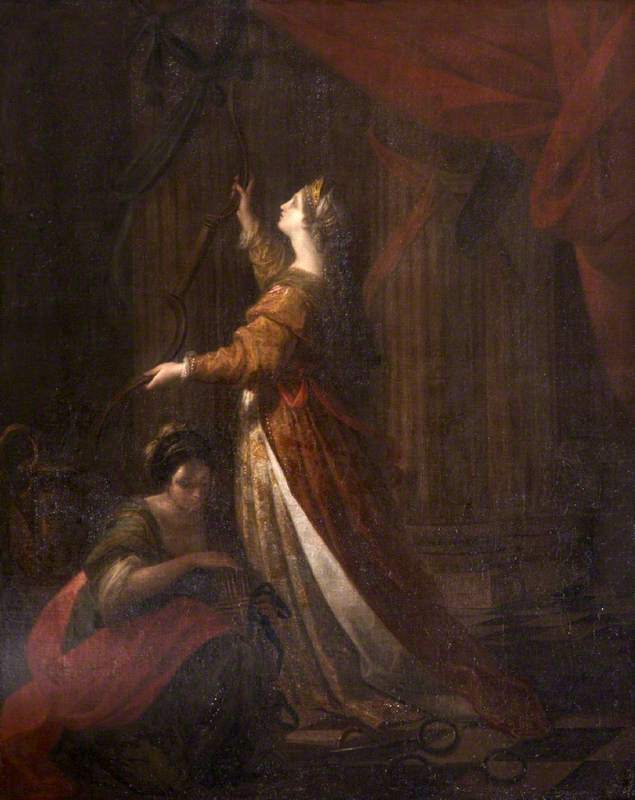 During these ten years Penelope also remained faithful to her husband, in stark contrast to Meda, wife of Idomeneus, and Clytemnestra, wife of Agamemnon, who both took lovers in the absence of their husbands. The war ended, and news of the Achaean victory reached the homelands of the Greek heroes, and slowly, the Achaean leaders returned home. Odysseus did not return though, and there was no news of Penelope’s husband since his departure from Troy. The absence of Odysseus soon emboldened the nobles of Ithaca, and many soon made their way to the palace of the king, to try and become Penelope’s new husband. The names, and numbers, of the Suitors of Penelope differ between sources, but amongst the most prominent of the Suitors of Penelope were Antinous, son of Eupeithes, Amphinomus, son of Nisos, and Eurymachus, son of Polybus. 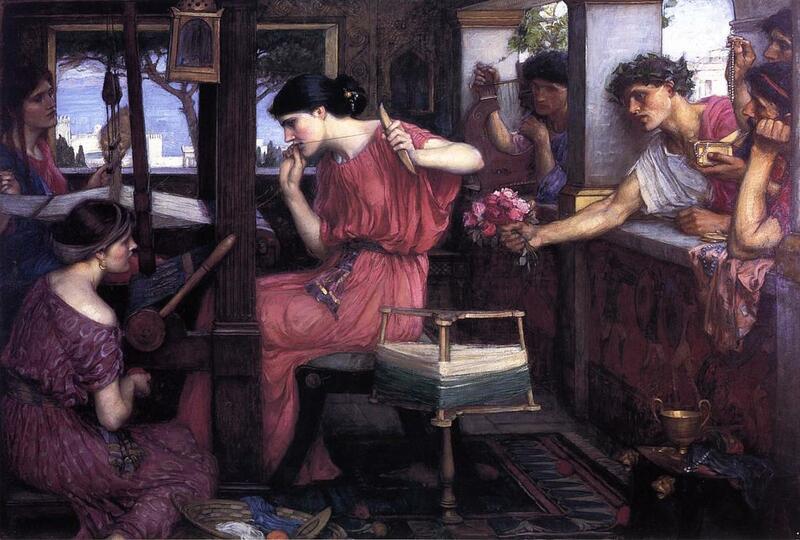 Penelope could not simply refuse all of the suitors, so instead sought to delay any decisions, thus she told the assembled suitors that she could not make any decision until she had completed weaving the funeral shroud of Laertes. 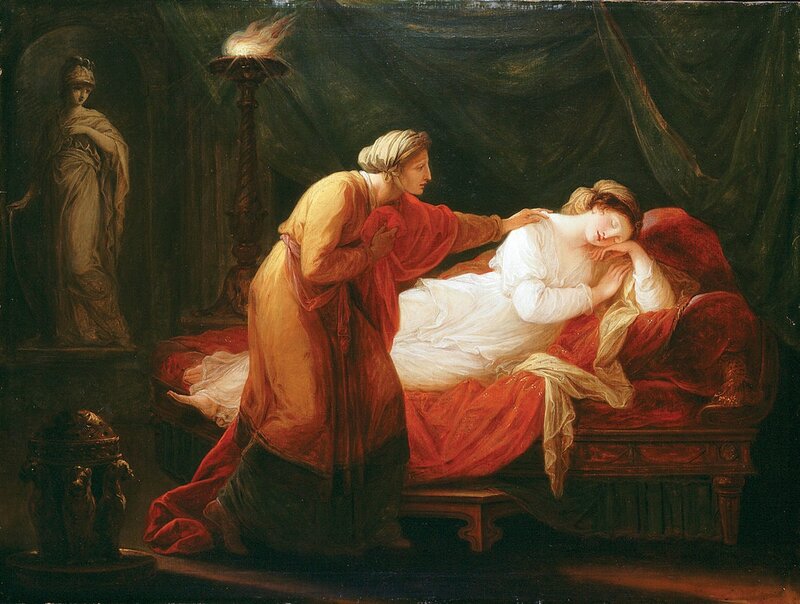 Laertes was Penelope’s elderly father-in-law, and although not dead, Penelope told the suitors of her shame if he died before the shroud was completed. Thus for three years the suitors of Penelope observed her weaving, but unbeknownst to them, each night Penelope would unravel her day’s work, so she was never closer to completing the shroud. Eventually though, one of the palace’s servants betrayed her mistress to the suitors, and now the suitors pressed for a decision to be made. As the suitors waited for Penelope to make her decision, they made free with the food, wine and servants of Odysseus. The Suitors of Penelope even plotted to kill Telemachus, the son of Penelope and Odysseus, perceiving him to be a threat to them and their plans. Eventually Odysseus returned to Ithaca after many trials and tribulations, and although his return was known to his son, the king visited his own palace in the disguise of a beggar. After 20 years of separation, Penelope did not recognise her own husband, but the tales that the beggar told of his encounter with Odysseus, heartened her after years of sorrow. The next day it seemed to the suitors that Penelope was finally prepared to make a decision, for the Queen of Ithaca declared that whoever could string the bow of Odysseus would be her new husband. It was a test of strength, but when presented with the bow, suitor after suitor failed to string it, but suddenly the bow was in the hands of the beggar, and with one easy movement the bow was strung, and shortly afterwards arrows were being unleashed by the disguised Odysseus. Thus, all of the Suitors of Penelope were slaughtered by Odysseus and Telemachus. Odysseus then revealed himself to Penelope, although Penelope initially refused to believe that her husband had at last returned home, but she was finally convinced when details of their marital bed were revealed. Then Penelope and her husband were happily reunited, and perhaps Penelope bore her husband two further sons, Ptoliporthes and Acusilaus, and if the prophecy of Tiresias, did come true then the pair died of old age. The faithful Penelope is the most enduring version of the Greek myth, and is the version Homer wrote down, and the one the Romans retold. Some writers thought it was a story too good to be true, and in keeping with many other tales, these writers ensured that there was no happy ending for Penelope and Odysseus. In some tales, Odysseus is exiled from his kingdom for the slaughter of the Suitors of Penelope, but in most versions of the exile of Odysseus, Penelope is not in the Greek hero’s company. This separation is perhaps because Penelope was not the faithful wife normally referred to, with the belief being that Penelope had slept with Antinous, or Amphinomus. When Odysseus discovered the unfaithfulness of his wife, some say that Odysseus killed Penelope, whilst others say that Penelope was sent back to the home of her father Icarius. Some writers would tell of Penelope being later seduced by the god Hermes, a relationship that brought forth a man called Pan. Those writers who told of the death of Odysseus also told of the remarriage of Penelope, for when Telegonus killed his father Odysseus, he sought out Penelope and made her his wife. This relationship was said to have born a son, Italus, the eponym of Italy. Penelope and Telegonus would perhaps, thereafter, be found upon the Island of the Blessed.